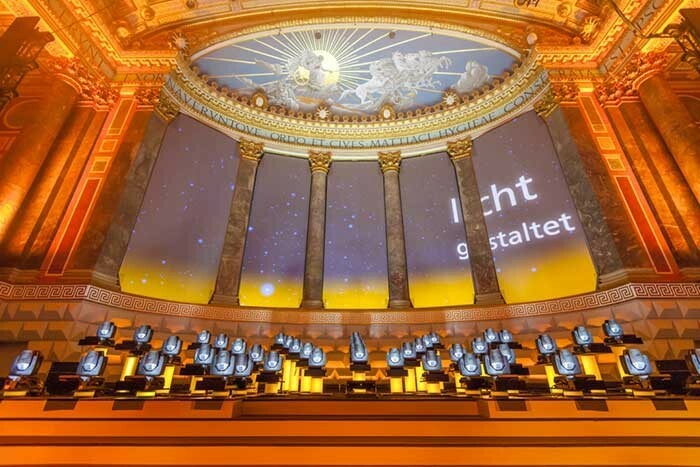 Germany – More than 60 Clay Paky Sharpys were perfectly programmed to create a ‘light orchestra’ which interactively illuminated the Fraunhofer award ceremony. 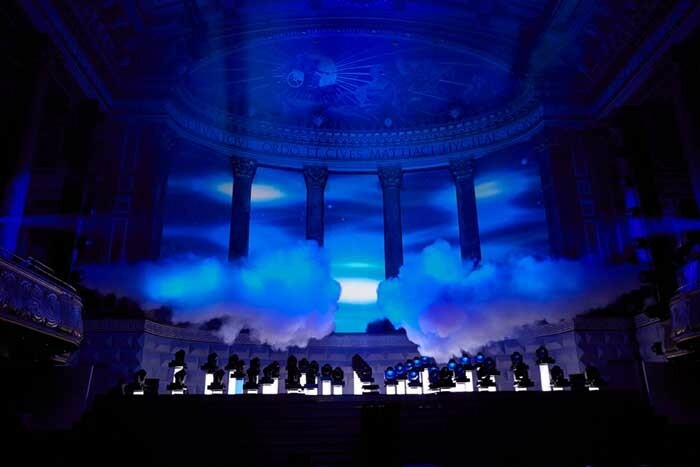 The incredible achievement recently won the LD Björn Hermann the OPUS German Stage Award 2016 for innovative stage- and theatre productions, which was presented during the 2016 Prolight + Sound show in Frankfurt. 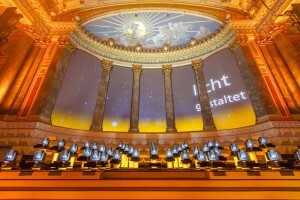 Held at the Kurhaus in Wiesbaden, the theme of the annual event was ‘lighting creates’, echoing UNESCO’s 2015 International Year of Light. Fraunhofer is Europe’s largest application-oriented research organisation, with research efforts geared towards health, security, communication, energy and the environment. The evening was attended by more than 700 people from politics, science and industry. Guests of honour included the German President Joachim Gauck and the Hessian Prime Minister Volker Bouffier. Together with onliveline – a bureau for concept and staging – lighting designer Björn Hermann, who has worked on the Fraunhofer award ceremony for seven years, was challenged with creating a light show that deviated from the norm and celebrated light in an unusual and eye-catching performance. 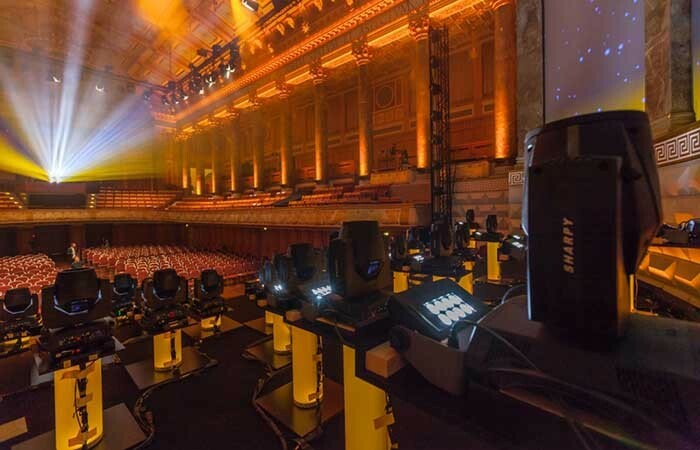 To create the ‘orchestra’, Hermann specified 45 Clay Paky Sharpys, rigged centre stage, and a further 16 Sharpys on stage left and stage right. All of the Sharpys were supplied by PRG AG Germany. During the performance, the Sharpys interacted with the huge video screen installed on the back wall – when Morse Code was represented with visuals, the Sharpys mirrored the signals with beams; similar effects were generated using the Sharpys’ beams to echo Fraunhofer’s spectral lines (named after the German physicist Joseph von Fraunhofer). 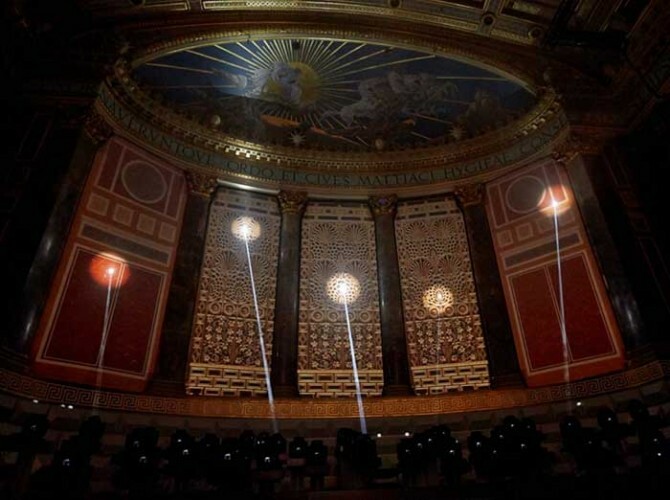 The movements or emotions were versatile: the Sharpys’ beams also illuminated the beautiful architecture of the hall, evoking emotion with colour, movement and interaction. When receiving the award at ProLight+Sound 2016, Hermann thanked Clay Paky for the products that allowed him to create the Sharpy orchestra piece but also projects such as the 25th anniversary of the fall of the Berlin Wall, 25 years of German reunification, lighting up Frankfurt’s bridges and many more.